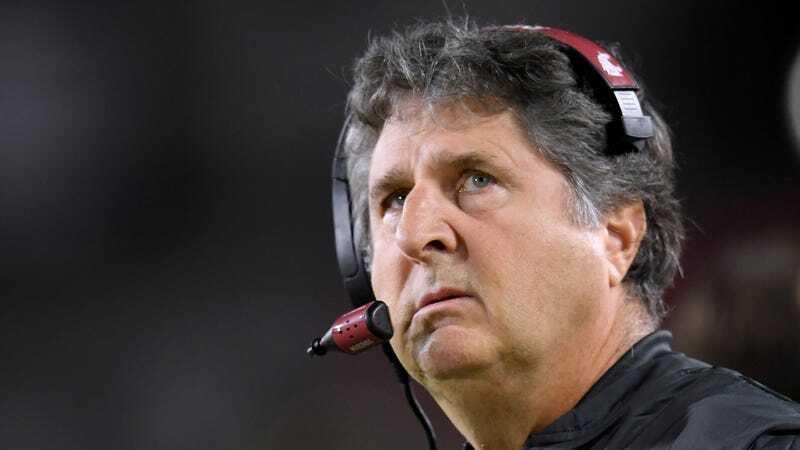 Even though he refused to comment after game about the non-flagged helmet-to-helmet hit on his team’s quarterback on Sept. 21, Washington State head coach Mike Leach ripped into Pac-12 officials about player safety just days after the fact through text messages, according to documents Yahoo Sports obtained via a public-records request. Among the officials Leach admonished was general counsel and senior vice president of business affairs Woodie Dixon, who reportedly phoned in to the USC-Washington State game and used his authority to overrule replay officials about a targeting call in the game. Leach naturally didn’t stop there. His textual tirade included a reference to a game with Stanford in 2015 where he not only accused Dixon telling the Washington State band to “quiet down” in that game, but also trying to manipulate the outcomes of Pac-12 matches in general. Dixon didn’t take kindly to the comment. But all of the hotheadedness from Leach’s end remained solely on the phone. A spokesman from the Pac-12 said in a statement that no official allegations have been brought forward from Washington State, and it doesn’t look like any will be soon. Leach is known for peddling conspiracies every now and again, but at least with these most recent accusations, it’s easier to understand where he’s coming from.